Showing results for tags '80003'. I finished her. It's finished but not perfect. I could have messed around with things even further and cleaned her up a bit more. I really probably could have left her sitting for weeks trying to figure out what else to do which is when I decided it's done. Pretty happy with the eyes on this one. Also, the chaps were the first time I'd attempted to do distressed leather which I think look pretty good for a first attempt. Probably could have gotten clearer pictures but didn't want to fight with the phone any longer. ETA: C&C welcome. 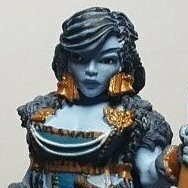 I'm pretty sure this figure must have come from Reaper's first Bones Kickstarter, because they had real trouble with facial features not filling out properly in the mould on a number of the miniatures. This is one such. In Reaper's catalogue, this is 80003: Ellen Stone, by Bob Ridolfi, but I always call her Jenny No-Nose because, well, she has no nose. Rather than try to fill in her missing features with paint, I've just painted her with a flat rag-doll face with no eyes or nose and just a gash for a mouth. She's a Weird West gun-babe. Things have been a little rough for me lately and I haven't been painting, but last week my dear husband got some paints out and I started working on random stuff. This is the original Ellen Stone with no face, from the Vampire box. I'm pretty happy with how she came out. Results of painting in tonight's hangout: 9 ghouls, 3 zombies, Rex, Ellen Stone, and a Strumpet. Still need some guy with a knife, some police, and possibly a vampire for a game Saturday evening. Once upon a time there was the first Bones Kickstarter, and one of the figures, Ellen Stone, came out of the mold somewhat lacking in the nose department, and people said, "What can you do with a noseless cowgirl?" and someone (It may even have been me) said, "Paint her up as an alien." Somewhat later I was musing over the Githyanki (who seem to keep cropping up in games I'm involved in) while sorting through my Bones minis looking for inspiration (as you do). In my bag of cowboys (Yes, I sort my Bones minis by theme), I ran across the old Ellen Stone figure, as well as a man's figure which, I realized upon close inspection, seemed to have a skull-like face, almost zombie-like, certainly lacking a nose. And something clicked and I thought "Oooh, yuss." Now, I don't absolutely know for certain that I ever will have a use for a couple of Githyanki desperadoes, and yet, here they are. First is the Bones Ellen Stone, SKU 80003. WIP thread here.